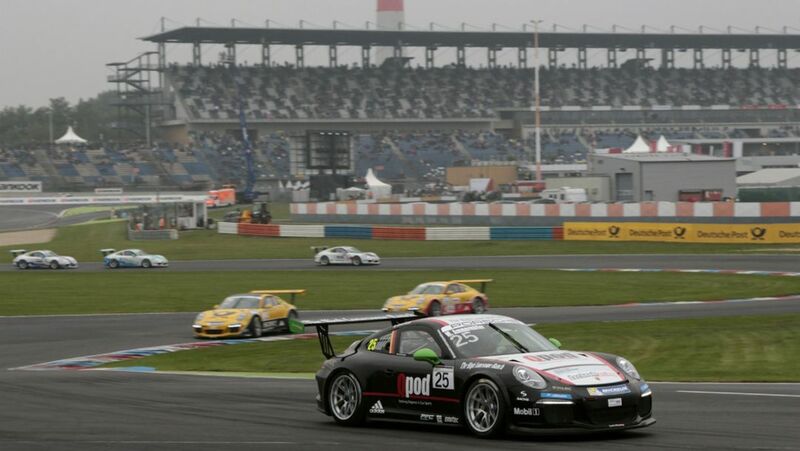 Michael Ammermüller has claimed even two victories at the Porsche Carrera Cup Deutschland on this weekend. The driver of Walter Lechner Racing team now ranks first in the series. The two races at a glance. The scheduled qualifying session to determine the grid positions for Sunday’s race did not take place due to the fact that the dense fog could prevent the rescue helicopter from taking off in the event of an emergency. Finally at 3pm under rainy conditions the qualifying began. The session, however, had to be red-flagged four times as a result of cars spinning on the track. In the end, Ammermüller clinched pole position for Saturday’s race, with Clemens Schmid (A/Lechner Racing Academy ME) starting from the first grid spot on Sunday. When the field set off at 18.05 hours on Saturday evening, Ammermüller stormed to the front ahead of Nicki Thiim (DK/QPOD Walter Lechner Racing) and Eng. In the first corner, a midfield collision on the damp track resulted in Robert Lukas (PL/Förch Racing by Lukas Motorsport) having to park his vehicle. The safety car was sent out. The re-start after two laps went without mishap. In lap six, the order was reshuffled with Thiim receiving a drive-through penalty for a jump start, which threw him down the field from second place to position 21. The order now was Ammermüller, Eng and Porsche junior Sven Müller (D/Team Deutsche Post by Project 1). Müller attempted to put Eng under pressure with Ammermüller ultimately benefitting from their battle. The 28-year-old Lechner pilot pulled clear and put eight seconds between him and his pursuers. Müller drew the short straw and fell back to position three. “I made a tiny mistake, but Engelhart saw it straight away. He and Schmid made their move and overtook me. Luckily I managed to reclaim Schmid,” exclaimed Sven. Riberas: "Unfortunately my start wasn’t that great"
Schmid swept over the finish line in fifth, with Jeffrey Schmidt (CH/Lechner Racing Academy ME) in sixth followed by Christopher Zöchling (A/Konrad Motorsport) in seventh. Porsche junior Alex Riberas (E/Attempto Racing by Häring) claimed eighth. “I started from twelfth so eighth is okay. Unfortunately my start wasn’t that great. This is something I have to work on,” said Riberas. Porsche junior Connor de Phillippi (USA/Förch Racing by Lukas Motorsport) took the flag behind Riberas and was satisfied with his race: “I came from 15th on the grid to position nine, despite sustaining damage to my car in the first lap crash. All the warning lights were on in the cockpit and I had less downforce than usual. Considering this I think it was pretty good.” Porsche junior Klaus Bachler (A/Team 75 Bernhard) received a 30-second penalty for driving too fast under yellow and was classified in position 22. Engelhart made an impressive comeback with his Porsche 911 GT3 Cup. The German headed into the race from position eleven to finally secure all-important championship points for third place. Result after race 13: Engelhart with one point ahead of Ammermüller (144). Eng on third with 132 points in front of Müller (130). Before Sunday’s race took off it appeared as if the rain-soaked 3.478 kilometre circuit would slowly dry up. Based on this, all 35 pilots opted to fit their 460 hp Porsche 911 GT3 Cup with dry tyres. At the start, several drivers struggled with the damp track surface, including Schmid who had taken up the race from pole position. The Austrian immediately lost his lead position to Ammermüller. Eng also started from a wet grid spot and fell back from second to sixth. Ammermüller and Schmid spearheaded the rest of the field and built up a comfortable lead. In lap 15, Robert Renauer (D/Team GT3 Kasko) slid from the track with his vehicle and had to be pulled out of the gravel. During this time the safety car was deployed. Up until that point, Eng had moved back up into position three and, with the safety car out, the gap between the leaders and the rest of the field now disappeared. Just after the restart it began to rain heavily and the race was red-flagged. Porsche junior Connor de Phillippi (USA/Förch Racing by Lukas Motorsport) finished on tenth: “The conditions during the race were difficult and I’m happy that I could make up three positions.” Porsche junior Sven Müller (D/Team Deutsche Post by Project 1) took home an early title from the weekend as the champion of the rookie classification. The 22 year old from the Rhine region holds 134 points ahead of Schreier (32 points). “In Sunday’s race I started from the wet side. I fought my way up the field, lost places and finally took the flag in twelfth. I’m sitting fourth in the championship at the moment and it’s all pretty close. I’m curious to see how things pan out over the remaining four races,” said Müller. There is no time for the drivers contesting the Porsche Carrera Cup Deutschland to sit back and relax. In just one week the next race weekend is on the calendar with the double-header on the Sachsenring near the German city of Chemnitz. The series is contested as support to the ADAC GT Masters from 19 to 21 September and returns after twelve years to the roller coaster track in Saxony. 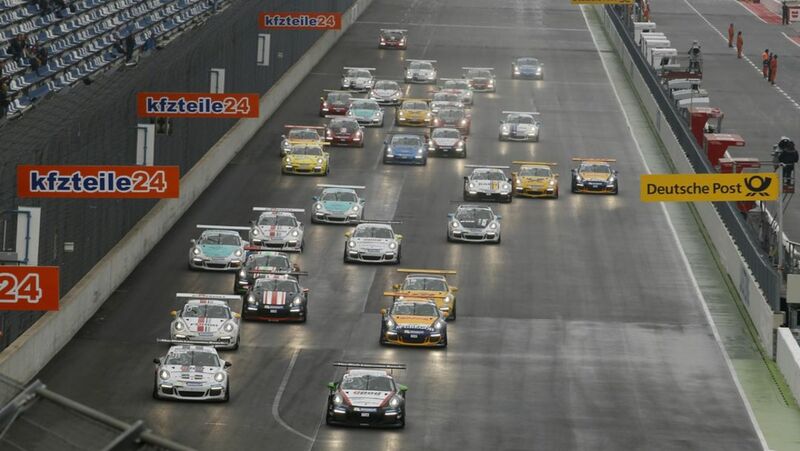 2002 was the last time the Porsche Carrera Cup was contested here on the heritage 3.645 kilometre circuit. Porsche is expanding its one-make motorsport series to include a virtual world championship. 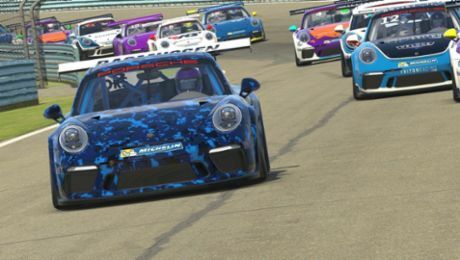 With full speed across the finish line: Porsche is supporting a new esports car racing series. Christian Engelhart celebrates his first win of the season in the Porsche Carrera Cup Deutschland.